My Dad & I were taking turns in two different stands. I walked to the stand a week before this and he was in my corn pile but ran off and of course I was a mess! I told my Daddy when we left that he was so fat his belly drooped between his legs. My daddy thought I was exaggerating a little. The next week I sat in Daddy\'s stand again and saw a doe. She came out 2 times but went back in where he later came out. At 6:53 pm he walked out, my heart was in my throat, and all I could think was OH GOD,HE\'S GONNA HEAR MY HEART POUNDING! I couldn\'t get the safety off I was so excited! It took a couple of minutes for me to get it together. At 6:55 he was on the ground! I could not believe it! I grabbed my phone and took a picture of him before I climbed out the stand because I just knew when I jumped on the 4 wheeler to get my Dad, he\'d get up and disappear. Got to my Daddy and when he asked me what did you shoot, my mouth was open but nothing would come out! We went back to the corn pile and when my Daddy saw what I had shot he stopped and said, OH MY GOD AMY, WHAT HAVE YOU SHOT!! 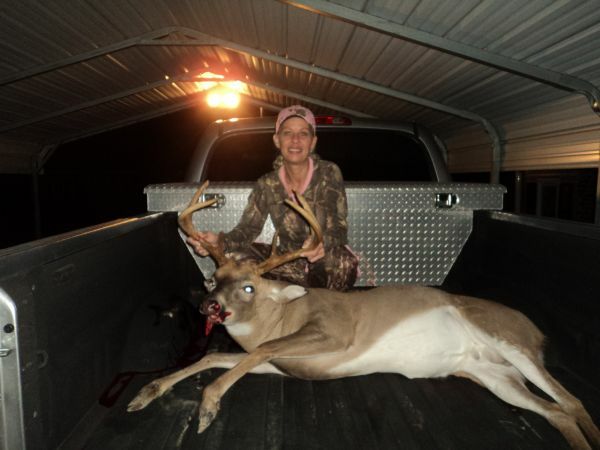 It then hit me, I was sitting in my Daddy\'s stand, OOPS....I BAGGED MY DADDY\'S DEER!! He was a 7 pt and weighed 177 pounds.